If you’re a lobster purist, you’ll need to cook a fresh lobster first, preferably in a pot of boiling water. Sadly, the lobster must be live when it’s cooked, since dead lobsters can be toxic. Once it’s done, carefully clean your lobster, being extra sure to remove and discard the viscera from the body cavity. Once you’ve got a cooked, cleaned lobster in play (however you managed it), put your butter, cilantro, garlic, and salt and pepper in a small bowl, then cut the lime in half and squeeze all the juice from one half of the lime into the bowl. Mix thoroughly. There should be some butter mixture left, so melt it down and serve it with the lobster, along with wedges from the remaining lime half. Easy! You’ll be licking your fingers and lips in no time, and I guarantee you that preparing (and eating) that lobster barbecue will be one of your more memorable grilling experiences. Dallas Wedding Caterers offer their services for special events including Weddings and Ring Ceremonies. Dallas BBQ Catering also provides perfect BBQ food, reasonably priced and presented in the authentic Texan style. Set up grill for indirect grilling. Rinse chicken inside and out and dry thoroughly. Generously season inside and out with coarse salt and ground pepper. Clean and lightly oil hot grates. Place chicken, breast side up, on opposite side of grill from heat. Cover and grill until cooked through, or a thermometer inserted in the thickest part of a thigh (avoiding bone) registers 160 degrees, about 1 1/2 hours, rotating halfway through cooking (if using a charcoal grill, add a couple of handfuls of charcoal every half hour to maintain heat). About 15 minutes before chicken is done, brush with 1/2 cup barbecue sauce. Let chicken rest 20 minutes before carving. Preheat grill for medium heat. Combine rosemary, butter, salt, and pepper in a small bowl. Cut potatoes into 8 wedges. Hollow out each center of wedge. Place potato wedges in microwave for 5-6 minutes. Remove and brush with butter mixture. Put potatoes on grill rack skin side up. Grill for 5 minutes, turn, and grill for 3 minutes. Add cheese to wedges and cook for an additional 2-3 minutes. Remove from grill, and top off with crumbled bacon, onion, and sour cream. Use this barbecue sauce toward the end of cooking. You want the sauce to cook on to the surface of the ribs, but you don’t want it to burn. Combine ingredients in a saucepan and mix well. Simmer for 20 minutes then allow to cool. Store in an airtight container in the refrigerator. If you make it a few days in advance the flavors will have more time to blend together. Big Racks BBQ is the ultimate destination for Award Winning Texas BBQ! Located centrally in Grapevine, we are your unrivaled BBQ and Sports Bar destination. Whether you are looking for a perfect lunch location, a dinner experience with the family, or you just want to cut loose with some of the friendliest waitresses in town and catch a game, Big Racks BBQ & Sports Grill has you covered! Join us with friends and family! Cheer on your favorite sports teams on one of our wall-to-wall High Definition LCDs! We have 96 inch and 120 inch HDTVs, so just like our food, size is never an issue! Oh yeah, unlike other so-called sports bars, there is never a bad seat in our house, we guarantee that! We aren’t just BBQ, we’re a BBQ experience. Pre-heat oven to 400 degrees. Combine all ingredients and toss to coat the carrots. Spread evenly in an oven safe dish and roast until just cooked, approximately 15 minutes. Remove from the oven and set aside.To assemble the dish, carefully remove the meat from the liquid and skim the short rib braising liquid with a ladle to remove any oil that has risen to the top. Put the liquid back on a burner and bring to a boil. Adjust the heat to support a simmer and continue to simmer until the liquid is reduced to approximately 2 C.While your braising liquid is reducing, heat a non-stick pan on medium high heat. Add 2 T vegetable oil to the pan. Once the pan is hot, add your spaetzle in an even layer and don’t move the pan for 15 seconds. Stir the spaetzle then add your carrots to the pan and ¼ C of braising liquid. Stir with a rubber spatula. Simmer until almost all of the liquid is gone. Add 1 T butter and stir. Set aside.Taste your braising liquid and adjust the seasoning. Divide your spaetzle between four plates. Place a piece of short rib on each and top with braising liquid. Serve. Brisket gets big Texas flavor from a BBQ sauce made with red wine, chili powder and lots of garlic. Combine rub ingredients in small bowl; press evenly onto beef brisket. Place brisket, fat side up, in stockpot. Combine barbecue sauce and wine in small bowl. Pour around brisket; bring to a boil. Reduce heat; cover tightly and simmer 2-1/2 to 3 hours or until brisket is fork-tender. Remove brisket; keep warm. Skim fat from cooking liquid. Bring cooking liquid to a boil. Reduce heat to medium and cook, uncovered, 8 to 10 minutes or until reduced to 1 cup sauce, stirring occasionally. Trim fat from brisket. Carve diagonally across the grain into thin slices. Serve with sauce. Mix all the ingredients for the barbecue braising liquid together in a mixing bowl. Marinate the pork shoulder in the sauce for several hours. Place in a casserole dish and cook, covered, for 3 hours at 300 F or until the pork is fork tender. Remove from the oven and use 2 forks to pull the meat apart into shreds. Add the sauce back to the pulled pork until you reach a sticky consistency but not so wet as it will be difficult to handle when making the perogies. 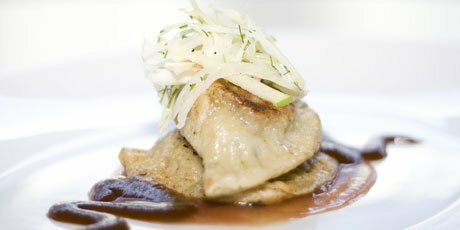 Any leftover sauce can be strained and served alongside the perogies as a dipping sauce or kept for other dishes as a condiment. Mix the dry ingredients in a bowl. Mix the wet ingredients in a second bowl. Add the wet to the dry and combine until a moist dough forms. Dump onto a floured work surface and knead until dough is smooth. Rest for several hours or overnight if possible before rolling. To make the perogies, a perogie mould can be used. If one is not available, follow the method below. Roll the rested dough onto a floured surface and use a rolling pin to roll the dough to a 1 mm thickness. Use a round cookie cutter (4” diameter) and cut the dough into rounds. Brush the edges of the dough with water and place a heaping teaspoon of pork filling in the middle of each round. Fold up the edges and press together using your fingers or a fork. Blanch perogies in boiling water until they float. Remove from the water with a slotted spoon and fry in a little olive oil until golden on both sides. Serve warm with additional barbecue sauce, sour cream, or fried onions. Visit Big Racks BBQ for the finest BBQ in Dallas and see the gorgeous Big Racks Girls.